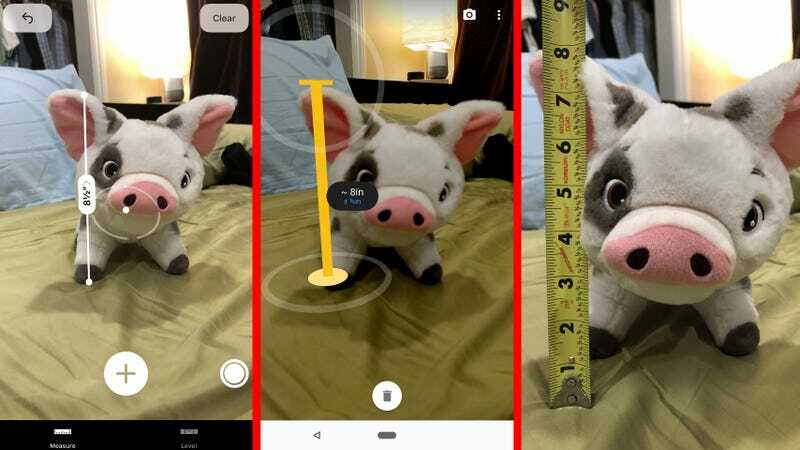 iOS/Android: The second everyone started talking about this crazy new smartphone feature called “augmented reality,” I thought two things: Most AR apps and games are going to be gimmicky AF, and I sure hope someone makes a great measuring app, because I keep misplacing my tape measure. Apple and Google each have their own measuring apps for iOS and Android, respectively. The former arrived courtesy of the iOS 12 public beta, and the latter launched for all ARCore-compatible devices a week or so ago. Of course, most people probably only have a single smartphone, so the choice has been made for you, but I was still curious: How does each app measure up? I have both an iPhone 8 Plus and a Pixel 2, so I thought I’d take each on a brief journey through my house to see just how accurate they are at measuring everyday objects. While I’m not going to toss my tape measure in the trash just yet, there are definitely moments when it’s more convenient to use an app to measure an item—or, at least, get a decent idea of how big it might be. Not bad! Both Apple and Google were spot-on with the height of the drinking glass. I thought they might have a few issues given the reflective surface the glass sat on and the transparency of the glass itself, but they both nailed it. Ten points to each house. If an app can’t measure a tape measure correctly—specifically, five inches’ worth of tape measure—we have a problem. Another tie! We are on a roll, Apple and Google. Ten more points for both houses, as I start pondering how much time it might take to create a second Triwizard Cup. While I’m not sure how often I’ll need specific measurements for Pua, the loving pig from the Moana movie, it never hurts to have that information in your back pocket. We’re looking at length and height this time (not width, as Pua is sensitive to such things). Apple’s Measure app was generally closer in its measurements than Google’s, due to the pretty big amount Google’s app tacked on to Pua’s length. However, Google’s app nailed the height perfectly, whereas Apple’s app never quite had either measurement on the nose. Though Pua is neither a horse nor a hand grenade, I might go with Apple on this one, simple because a half-inch is a much more forgivable distance than an inch and a half. So, this one is a little unfair, because I had a pretty strong suspicion that the way ARCore tracks planes would make it impossible to get a reading from a mirror attached to a wall. Apple wins by default on this one just for being able to take the measurement (in a messy space no less), but how accurate was its digital guess? Google measurement: 0", but I did get a lot of exercise waving my hand around to try and get the app configured. Though Apple’s Measure app didn’t quite nail the mirror’s height, a 1.5-inch difference is at least good enough for “ballparking it” with an object of this size—a mere five percent of its total height. While I might not use Measure if you need to make a precise fit for new home decorations, it’s at least good enough to give you a rough sense of how big a large object is. Don’t ask. Well, OK, you can ask. This was hanging in the lobby when I starred in one of the best musicals ever, Forever Plaid. It’s sitting on my floor behind my door, and not hanging on my wall, because having a giant picture of me looking at me would feel a little weird. Wouldn’t it? According to Apple’s Measure app, I am 25 inches by 32 inches. Both apps came within two inches of the actual horizontal and vertical measurements for this big photo. Apple’s app was slightly more accurate because of its stronger horizontal measurement (by an inch). Again, I’d use either app to get a general idea of how big an object is, but not a picture-perfect, needs-to-fit-exactly-in-this-space measurement. Because all this measuring made me hungry. I mean, I wouldn’t mind an extra half-inch of banana to eat, but Apple nailed the measurement on this one. Assuming you want to ignore my advice and use your smartphone instead of a ruler or tape measure for important purchases, like furniture that has to fit in a particular spot, how accurate is each app? Will you even be able to get your FÄRLÖV through the front door? Again, neither app had the measurements perfectly: Apple’s was two inches over on length and one inch over on height, and Google’s was three inches under on length and one inch over on height. This test also reminded me of the importance of making sure your measurement app is being reasonable. When I first attempted to measure the shoe rack, Apple’s app quoted a height of over four feet tall—a bit of an overshoot. However, I realized I was using the app by shooting down at the shoe rack at an angle, which isn’t an ideal position if you need the height of an object. Augmented reality apps are smart, but even they get confused sometimes. Once I moved my smartphone to shoot the shoe rack straight on, Apple’s numbers were a lot more accurate (but not perfect, of course). I generally had a better experience with Apple’s Measure app than Google’s Measure app because of the former’s slightly better accuracy and, more importantly, ease of use. Waving my smartphone around a bit allowed Apple’s app to pick up its “planes” pretty quickly, and the interface is a lot quicker to operate: just point the target at something you want to measure, tap, and move your smartphone until the target is at an endpoint, then tap. Boom. Measurement. Google’s app requires you to drag around markers and that takes way too much time. Apple’s was also better about automatically snapping your target to items/corners/things like that. That said, both apps are probably going to have a host of improvements going forward, so we’ll see how each pans out over the next year or so. These measurement apps, after all, are the perfect-use cases for augmented reality—the kinds of apps that everyone with smartphone would use on a regular basis. At least, I think I’ll get a lot more use out of a virtual ruler than a dinosaur that’s yelling at me in my bathroom or an augmented reality board game that I could just play in real life.